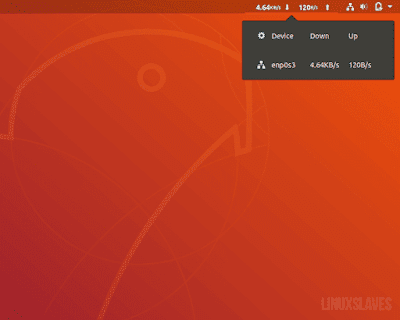 Linuxslaves.com - If you want to keep eye on network traffic in your Ubuntu Gnome panel, you can do it easily by installing Netspeed, an useful network monitor Gnome shell extension to shows the current download and upload bandwidth of a network device in the top panel. It's similar to Indicator Netspeed when Unity was the default Ubuntu's desktop environment. Gnome shell extensions are small pieces of code written by third party developers that modify the way Gnome works and (perhaps) enhances the capability of the desktop. If you are familiar with Firefox Addons or Chrome Extensions, Gnome Shell extensions are similar to them. Click the install button and confirm the pop-up to continue the installation. It will start automatically and displays current internet activity on top-right system tray area once the extension installed. Enjoy the Netspeed on Gnome desktop. Thanks for reading!.